Back in March 2012 we did an experiment: we gave up wheat. DH had been saying for ages that he thought he had a problem with wheat. I had countered (for ages) that his problem was not wheat, it was portion control. Back and forth we went. And then finally, one day, I suggested we give up gluten, as a food experiment. More than 18 months later and we are still gluten free. Well… DH is still gluten free. I occassionally have wheat (gasp). A sandwich may pass my lips. A cheeky croissant while in France for business has been known to find its way onto my plate (and into my belly). When it comes to food, and eating, I believe we all need to choose the path that is best for us as individuals. —> Fruits and vegetables are great, eat as often as possible. —> It is always better to make your own than buying something ready made. —> Unless you make it yourself, you really have no idea what goes into a food. In keeping with my truisms, I stopped buying ice cream – the last container I bought was in October 2011. Around that point in time I had bought myself a treat to celebrate the end of house renovations – an ice cream maker. And since then, the only thing you will find in our freezer is freshly churned goodness. When you make your own ice cream or sorbet, you become painfully aware of just how much sugar can go into the process – some recipes use 500 grams (1.1 pounds) for a quart!! We moved our house to a completely gluten free environment. I use a flour substitute (that I mill myself in accordance with the Ideas in Food gluten free flour blend) and honestly you can’t tell the difference. But what you do notice, when you mill your own blend, is that flour especially gluten free is not exactly healthy (full of nutrients) – I mean, when corn starch is a major ingredient, you are basically milling texture, not nutrition. So as a consequence, I eat a lot less of foods that use flour. It is for treats, not staples. Back to the subject of this post. This past weekend I went to Zurich for a girls’ weekend. I decided that for the weekend, I would just eat wheat and not worry – in for a penny, in for a pound, as they say. So I did. I had a little wheat bender. I find these types of choices – to just eat with reckless abandon – to be instructive. Remember, I think that we are all our own experiments. So I wanted to see how my body would react. So on Friday night when we went for a traditional swiss fondue, I committed to the indulgence. 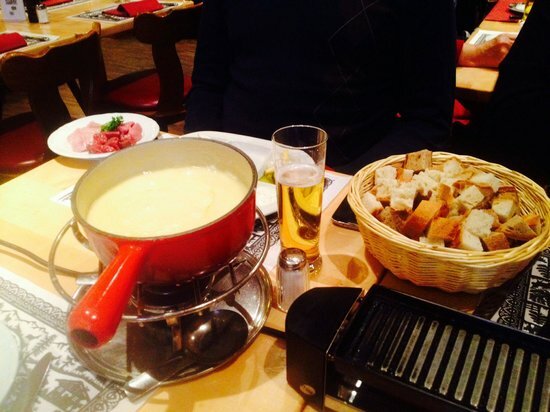 Photo of fondue at the restaurant Swiss Chuchi is courtesy of TripAdvisor. I dunked tens of pieces of bread into molten cheese. I even tried pre-dipping the bread into kirsch – apparently this is medicinal and prevents constipation – I thought it was pretty gross tasting. For breakfast I enjoyed croissants—I have yet to find a good gluten free croissant, and still have not tried my hand at making them at home. And even though I left the weekend feeling a bit short on vegetables (is it just me or do the Swiss not eat a lot of fresh vegetables? ), I also left with a few reflections. First, I am a much happier person not eating by dogma but eating in accordance with what makes me feel good. Next, I think that—for me anyway, without an allergy—bread is not bad. In general I do not eat bread. But the occassional bit of bread does not cause any violent reaction in me. Yes, my stomach grumbles a bit. But I attribute that to what happens when you eat a food you have not had in a while. And with the sheer volume of bread I ate, I was a bit stopped up. Again, I think that is a consequence of not eating bread and not being used to digesting it. I also don’t think bread offers much in terms of nutritional value. But as an occassional thing? Why not. Finally, I think it is important to remember—do what is right for you. Experiment. Decide how you want to eat. Think about your choices. Dig beneath the surface, try and find out about the science. Make educated choices. And don’t push your point of view – whatever you have chosen – onto other people. There are few things more maddening than food police, those who point at your plate and proceed to lecture you on how your choices will kill you. Anyway, I had a wheat bender. I lived. It did not cause me to gain weight, although I may be a bit bloated at the moment (I can’t tell if this is from food or travel). I enjoyed eating vast quantities of bread in molten cheese, accompanied by a glass or two of white wine (apparently red wine with fondue is NOT a thing). And now that I’m back home and putting my focus firmly on getting healthy and kicking my nasty autumn cold, bread is back to the rare treat category for me. 23 March 2012: Two weeks into our gluten free experiment. 18 April 2012: Four weeks into our gluten free experiment. 8 March 2013: One year on and a review of Wheat Belly. On Healthy House Frau, Lindsey Schnell’s blog, there is a great post called “Fed Up with Food Fear Mongering”—I loved this post, even if it is a bit long. Lindsey’s basic premise is that dogma tends to be motivated by profit. I think her advice is wise. Look to the science. Be wary when you read posts from people who are seeking to profit from their points of view. Isn’t it a shame that in our society, balance and normality just won’t sell so don’t get any airtime? Very interesting. I had fondue here with four cheeses years ago and felt unwell, so have been reluctant to try it again. I enjoyed it at the to of Mt. Pilatus many years ago, though. Not all bread is equal. Many people are eating rolls from places like Subway which has lots of artificial additives to make it rise quickly, etc. Wholewheat flour does have some benefit, I believe. And, you can add nuts, seeds, dried fruit, etc. for a ‘value added’ loaf. Though I went Whole30 & Paleo back in March 2013, and follow it strictly most of the time, one of my indulgences is the bread and butter at our favorite French restaurant once a month or so. Nothing like that crusty goodness, and lucky for me, I do not have a bad reaction. Now if only I could forget how seriously sugar/sweets affect me! Tired, cranky, low energy. Sad trombone.